The children have been busy, so it's time to showcase some of their finished objects. For the end of term they both made polymer clay necklaces for their teachers. The beads were simple balls, some plain and some marbled as well as Little Miss wanting to make some with "flowers" in - sadly these didn't quite turn out like the beads we had pinned on Pinterest, but considering she's 4 I think she did a great job, with minimal input from me. (I made the holes and put them in and out of the oven, but the kids did the rest.) Two of My Boy's teachers were wearing theirs when I collected him on the last day of term, so he was very happy! The other FO is this lovely papier maché stag head from Homecrafts. More help was needed with this, especially for the antlers which were fiddly for small hands but Little Miss had a great time ripping up the paper and sticking it on with PVA glue. I'm not sure where (or how) it will be mounted, but fancy it as an addition to the Cwtch - it may not have been entirely co-incidental that she had paper in the right colours *wink*. I have loads of things in the works and almost a whole day of crafting (on my own!) planned for tomorrow. I'll show you more next week. Have a lovely weekend and remember to check out the other FOs at Tami's. Looks like there's a lot of fun to be had at your house. Excellent projects, and so colorful! 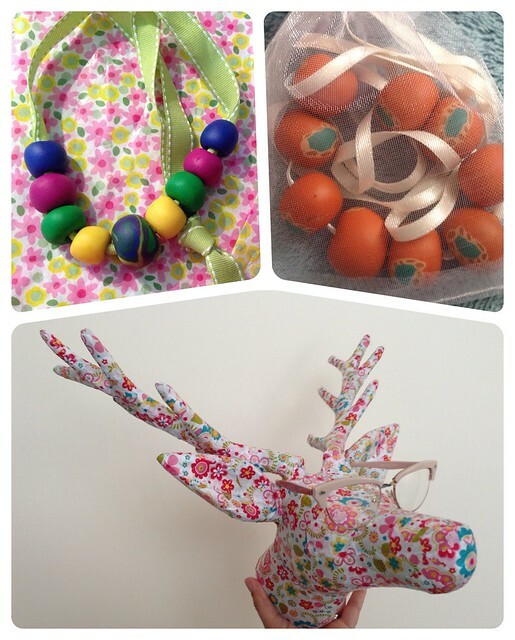 Your stag head is great fun, I'm sure it will look fab anywhere! your deer head looks great, I'm a bit embarrassed that yours was done by a child and I also decopatched mine! Those necklaces are wonderful. What a great idea. I have a Pin like that somewhere. Necklaces can be so ridiculously expensive nowadays. What a great teacher gift idea! I might have the kids make one for me too!